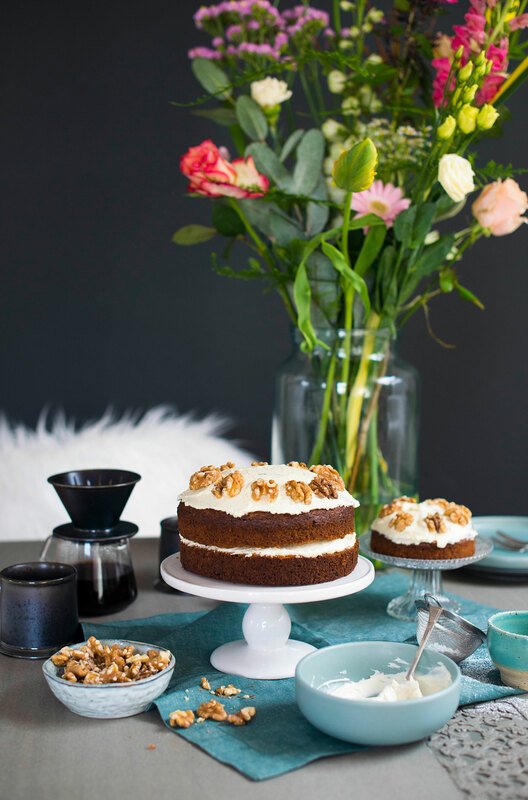 I am back from an almost two months baby break, with a recipe for my all-time favourite cake: carrot cake with cream cheese frosting! Whether you bake it for yourself of for the upcoming Easter festivities: It is a very quick and simple recipe! 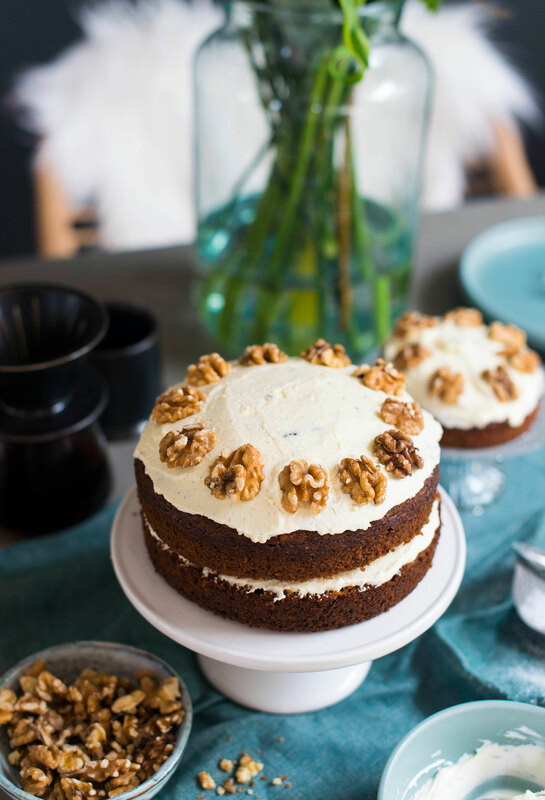 This carrot cake with cream cheese frosting has been my most favourite cake recipe since the age of 18, when I was in Australia and literally lived of carrot cake (I had not seen nor tasted carrot cake in Germany until that time). Back in Germany, I wrote down a recipe that worked out perfectly; I have rarely changed it over the years! The cake has been the show stopper at many brunches, birthday parties and dinners: Again and again friends and family ask me for the recipe! 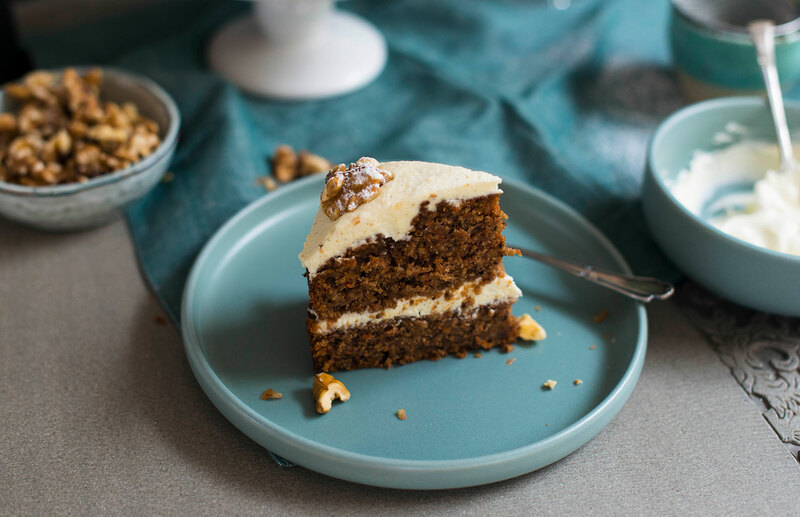 The recipe has already been published in my food column in Mio magazine; on the blog you also find a vegan attempt on the cake which worked out well! 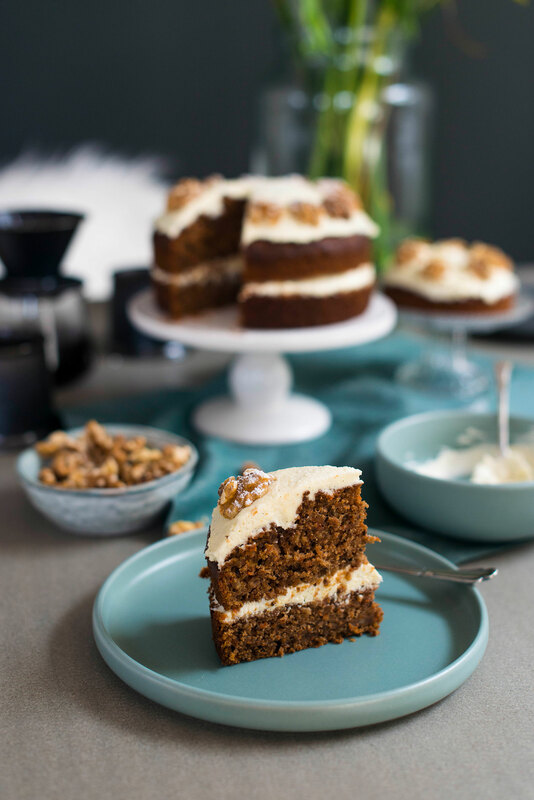 Have fun baking and enjoying this simple carrot cake recipe! I look forward to hearing from you whether you love it as much as I do! For one cake (one 23–25 cm baking tin OR use a 18 cm tin and divide the cake in two halves). Preheat the oven to 170°C (upper and lower heat). Line the baking tin with baking paper, lightly grease the tin. Wash the carrots, roughly chop them and place them into the bowl of a food processor. Pulse until finely chopped. Add walnuts, pulse again for a few seconds until walnuts are roughly chopped. (If you do not have a food processor, grate the carrots and chop the walnuts). Mix wholemeal flour with flour, spices, baking soda and baking powder. Whisk together oil, sugar, eggs and molasses. Mix with the dry ingredients. Fold in carrots and walnuts. Add the batter to the prepared baking tin, bake for 50–60 minutes until done, but still moist. Allow the cake to cool in the tin, remove the tin and divide the cake in halves horizontally, if desired. 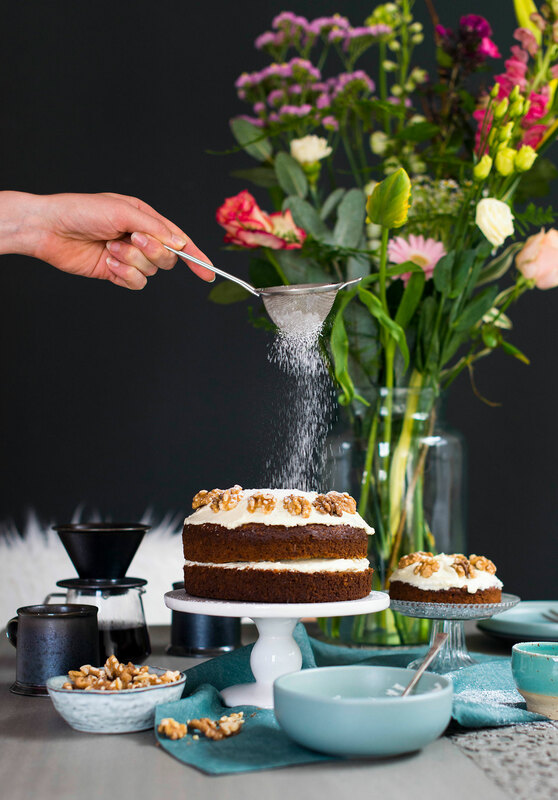 For the frosting, sieve icing sugar, whisk together icing sugar and butter until creamy. Fold in cream cheese and vanilla, until it is a creamy frosting. 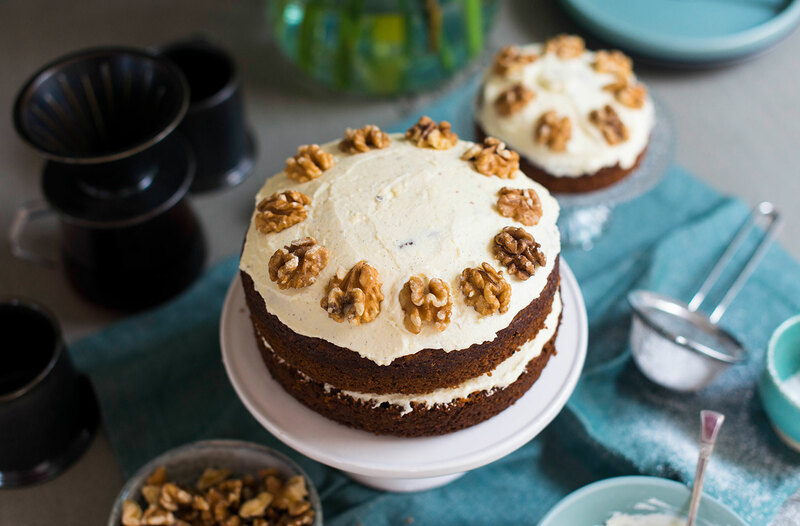 Spread the frosting onto your cake (or onto both halves, then assemble the cake), and garnish with walnut halves or chopped walnuts to serve. Cool the cake in the fridge until being served.